Najaf (Arabic:النجف; Transliterated: An Najaf; Persian:نجف) is a city in Iraq. 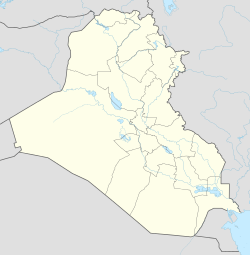 It is about 160 km south of Baghdad. In 2008, about 900.583 people lived there. The city is the capital of Najaf province. It is one of the seven holy cities of Shia Islām. It is the center of Shia political power in Iraq. The city is home to the Imam Ali Mosque, where Alī ibn Abī Ṭālib, the fourth caliph is buried. Shia Muslims consider the mosque to be the third holiest Islamic site. Hārūn ar-Rashīd founded the city on the site of Alī ibn Abī Ṭālib's grave in the 8th century. Najaf was badly damaged during the Iran-Iraq War and the Gulf War. In 1991, there was a Shiite uprising in Najaf, which was suppressed by Saddam Hussein. This conflict caused many deaths, there are mass graves around the city. In 2003, a suicide bombing caused widespread damage. 120 people died, including the moderate imam Muhammad Baqir al-Hakim. In April 2004, forces of Muqtada as-Sadr captured the city, as well as the city of Kut. Before the 2004 elections, a part of the occupying forces left the city. This mosque is the most important Shi'a mosque in Iraq. The city is now a great center of pilgrimage from throughout the Shi'a Islamic world. It is estimated that only Mecca and Medina receive more Muslim pilgrims. Shia Islam's second most important figure is buried in Najaf. the Imam Ali Mosque is considered by Shias as the third holiest Islamic site. The Imam Ali Mosque is housed in a grand structure with a gold gilded dome and many precious objects in the walls. Nearby is the Wadi-us-Salaam cemetery, reputed to be the largest in the world. It contains the tombs of several prophets and many of the devout from around the world aspire to be buried there, to be raised from the dead with Imām Alī on Judgement Day. Over the centuries, numerous hospices, schools, libraries and Sufi convents were built around the shrine to make the city the centre of Shīʻa learning and theology. The Najaf seminary is one of the most important teaching centres in the Islamic world. Ayatollah Khomeini lectured there from 1964 to1978. Many of the leading figures of the new Islamic movement that emerged in Iraq, Iran and Lebanon in the 1970s studied at Najaf. ↑ 7.0 7.1 Iraqi forces in Najaf take cover in important Shia shrine, The Boston Globe, April 2, 2003. "For the world's nearly 120 million Muslim Shias, Najaf is the third holiest city behind Mecca and Medina in Saudi Arabia." ↑ Hala Mundhir Fattah; Frank Caso (2009). A brief history of Iraq. Infobase Publishing. p. 140. ISBN 978-0-8160-5767-2. Retrieved 18 October 2010. ↑ Ring, Trudy (1996). "Najaf". Global Security. Retrieved 2009-09-13. ↑ Mallat, Chibli (2004). The Renewal of Islamic Law: Muhammad Baqer As-Sadr, Najaf and the Shi'i International. Cambridge University Press. Retrieved 2009-09-13. ↑ "Weatherbase: Historical Weather for An Najaf, Iraq". Weatherbase. 2011. Retrieved on November 24, 2011.